The United Torah Judaism and Shas parties are coordinating with the Union of Right-Wing Parties on some issues affecting religious observance in coalition negotiations with the Likud, a UTJ spokesman confirmed to Hamodia on Monday night. 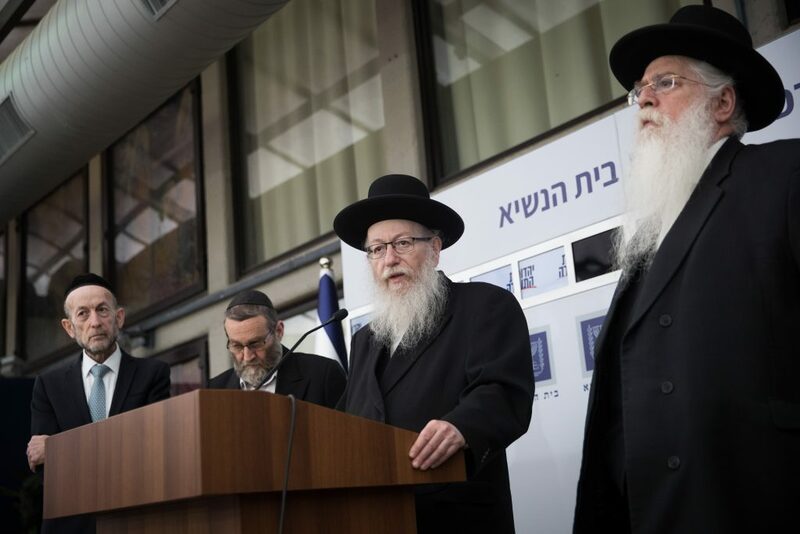 Earlier in the day, UTJ MK Rabbi Moshe Gafni had been quoted in local media as saying that the three parties would “form a united front against (Avigdor) Liberman,” who is demanding changes in the religious status quo as the price for joining the coalition. Liberman’s Yisrael Beytenu party based much of its election campaign on supporting public transportation and allowing mini-markets to operate on Shabbos, ending the Chief Rabbinate’s control over marriage and divorce, and implementation of the Defense Ministry’s proposals for new regulations for military exemptions for yeshivah students. Rabbi Gafni was unbending in his opposition to Liberman: “If our positions are not accepted, there will not be a coalition. It is inconceivable that Liberman, with his five seats, would establish terms (against the beliefs of) three larger parties.” The parties have a combined 20 seats—21, if reports that UTJ will regain its eighth seat in the final vote count. However, the expectation is that Liberman will back down, and the coalition will succeed, the source said.